I must admit I am a kitchen gadget junkie, drop me off at any Williams Sonoma, Bed Bath & Beyond, or heck, even a lowly bottom of the rung department store, and I can pick up something that I think might be useful in the kitchen. 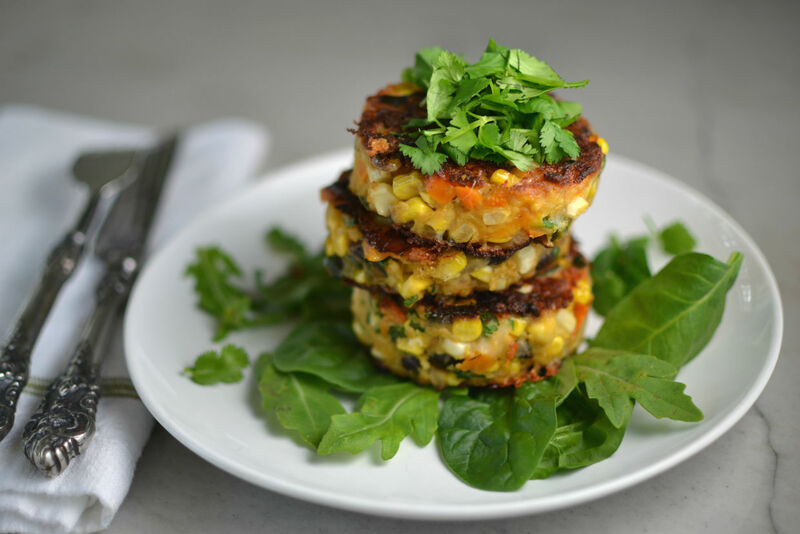 After making these Corn Black Bean Fritters, which were really a pain to keep intact. I really could have used a round metal mold. With all my hours spent pursuing housewares how is it that I never picked any up? I did have a biscuit cutter though. Similar in that they are round and metal, with the addition of a handle on the top. No worries, I just scooped up some batter with an ice cream scoop (so they are all the same size) plopped it down on a board lined with parchment then maneuvered the biscuit cutter over the top and using the back of a spoon smushed it all down nice and compact. My experience with any fritter or veggie burger, has been that they, more often than not, fall apart when cooking. I have had some good results in a cast iron pan, and don’t even want to talk about how many times I have tried to cook them on the BBQ THEY FALL APART! No matter how many useful tips are added to the recipe, and no partial freezing does not work. What does work is to squish them into a form and press down until they are super compacted. That, my friend, does work. These look delicious…I would eat this with a Corona on the side. I can’t find the black beans in the recipe instructions or ingredients. Breanne, Thanks for catching that for me! All fixed.